Sylvia enjoyed the feeding of the chickens and their tricks. What did we do while daddy was away? and Daddy and his friends dominated at curling and won a nifty coffee mug! I was trying to capture Sylvia's messy spaghetti face and body and she started saying cheese-cheese-cheese. I think they must have them say cheese at daycare because she was really into it. Maybe she had a spaghetti buzz? I get to watch chickens do tricks and Adam gets a boys curling weekend in WI. Thanks for the great pic Missy! This past Sunday we drove out to Hutchinson to celebrate Grandma B's birthday and enjoy some time at the fair. It is amazing to see the difference a year makes... Sylvia knew a bit of what was going on last year, but this year was much different. She pointed out 'her' cow and 'her' sheep and 'her' bunny... well you get the picture. The cow building was Sylvia's choice for the first place to check out. There were some baby cows, but I think they where still to big for Sylvia to be comfortable with. The turkeys, ducks, chickens, and rabbits are all contained in one building. I think these were more her size. The last stop was the sheep barn. This one 'talked' to Sylvia as we were leaving. It was a little freakish sounding... kind of like a little person talking. By far, the highlight of the fair was watching "Rock and Roll" Buck ZunHofe and his crew set up the wrestling ring in the middle of the beer garden. Now I am guessing most of you don't follow wrestling, and if you do, it is likely not this type of wrestling. For your reference, check out his website... 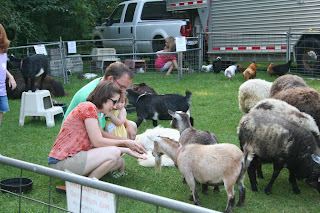 If you are interested, chances are he will be back for the Sunday afternoon showing at the 2011 McLeod County Fair. 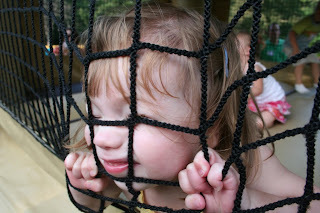 Last Saturday morning the family headed over to Lake Elmo Park to play on their massive playground. Not only do they have this huge park, but also a filtered man-made swimming lake. As far as we can tell, Sylvia thinks these are two separate places, so we don't have to spend time at both of them on a single visit. They even have a 30 foot slide! "I can climb by myself daddy!" And finally, the Pirate Ship. The boy in the green shirt (Ian) was the man of the hour. He was busy 'saving' everyone from the volcano, the tornado, the fires, and the bad pirates. You see, he was a good pirate - a scientist pirate - as he put it. It was his duty to protect all of us mere mortals from the dangers of the park. This kid had a crazy imagination, but gave us a few laughs and a new friend for Sylvia to play with. As we were leaving, he thanked us for coming to his park and hopes we come back again soon to play. I am thinking this kid works for Washington County or something? Our kitchen table arrived yesterday - hand delivered by the craftsman, Jeff. The lumber is all reclaimed, and in this particular piece, from a 1880's-built barn near Watertown, MN. While the picture doesn't do this table justice, it may give you a little sense of the character that old lumber has. It is waiting for guests to come over and enjoy a pizza party or a birthday cake on it! As mentioned in our previous post, we had the 3M family picnic but failed to bring the camera with. Luckily Liz was able to share some of the pictures with us. 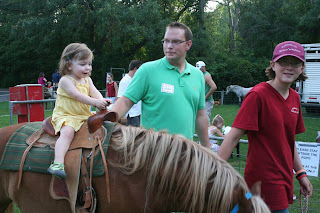 Sylvia enjoying the pony ride - notice both hands are gripped tightly onto the saddle. A proud dad looking on as the teenager pulls around my daughter on her 1st pony ride. 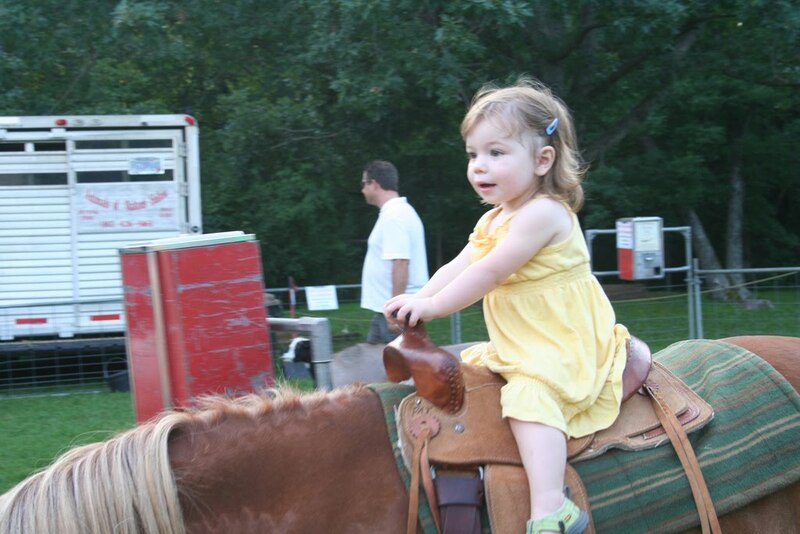 It wasn't all pony rides however... Apparently, Sylvia was under the impression that she could get out of the jumpy castle through the netting!?! 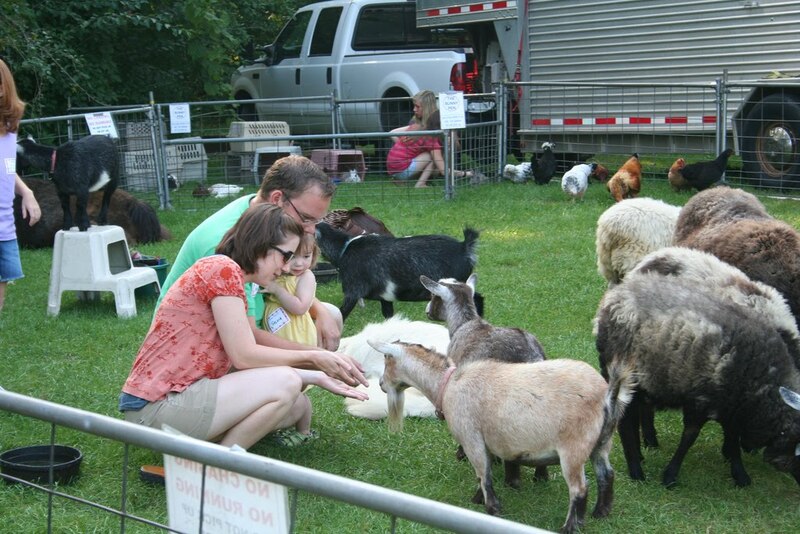 And finally a quick picture of the goat herd that was "attacking" small children. No picture of the killer turkey, but believe us, he was there somewhere. 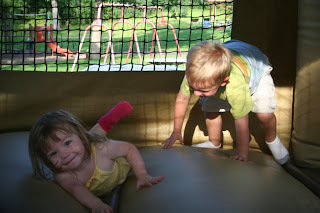 Tonight we attended a picnic at Tartan Park with Adam's 3M division for a family picnic. Even though the weather was ridiculously hot and humid, we had a great time. They did a fantastic job setting up events for the kids including a petting zoo, a bunch of jumpy castles, a climbing wall, and even pony rides. 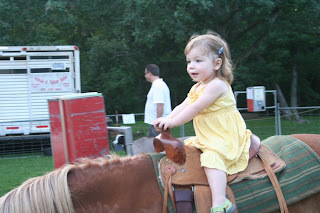 (I think I have to buy Sylvia a pony now - FYI). After the dinner was over we enjoyed a fudge-sickle with mom and then spotted the spray on tattoo stand. From a mile away, Sylvia spotted the monkey. Eat your heart out Auntie Leah. Since we are bad parents and didn't bring the camera, Sylvia was kind enough to pose for a couple pictures before bath time - even though we were already late for bed time... I think she was a bit hopped up on the fudge-sickle. Liz is a good parent and brought her camera, so hopefully we will have a picture of Sylvia's 1st pony ride at a later date.